For some reason my kids have ended up with a passion for hobbies that are both expensive and very much unsuited to inner city living. Miss 10’s passion for horseriding can be fulfilled any time of year, and summer was perfect timing for Mr 8’s Monster Slide birthday experience. Miss 8, however, has settled on skiing. Now I’m pretty good at organising most things, but skiing in the middle of summer is a little out of my league. Thankfully Snowplanet is only a 30 minute drive north of us. What’s more they aren’t terribly busy this time of year so it’s easy to pick up a ski pass deal on Grabone. We snapped up some $15 all day ski passes. You had to buy passes for a specific day so we chose the Monday after Miss 8’s birthday. It meant everyone taking a day off, but that made it feel all the more special and – given we still had to pay for boots, skis and other bits and bobs – also made it an affordable option for a family of five. While the tickets we bought were for a 10am entry, a quick phone call confirmed we could arrive any time we liked on the day we had booked. We got there mid-morning and despite the place being empty, sorting out and paying for gear hire seemed to take an extraordinarily long time. Husband has his own skis and boots so only four of us had to hire, and that came to $107. On top of that there’s plastic ski pass cards to pay for ($5 each, but it’s refundable), and if the kids fancy mixing it up a bit with some tubing, they’re another $10 each. Mix it up with a bit of tubing. Once inside, the skiing options were much better than I had expected – not only did we have the whole place to ourselves, the slopes were steep enough to be interesting and there was a terrain park full of jumps for those who want something more challenging. 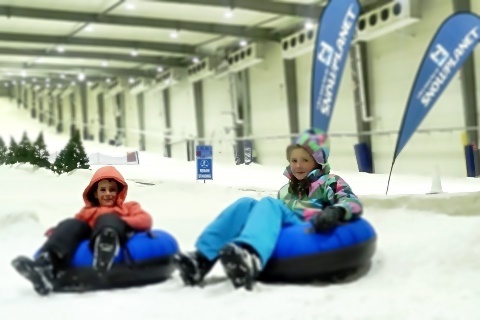 There’s also a very safe learners area with a magic carpet, and a separate (and nicely moguled) area for tubing. We started on the learners slope but it wasn’t long before husband and Miss 8 were on the pommel and heading for the top. The slope is pretty good for an indoor field, steep at the top and with enough starting points for everyone to head off at the same time. The snow was perfect – nice and powdery with the odd patch of ice to keep you on your toes. We had our own food for lunch so were asked to eat outside. Apart from the fact it was 28 degrees out there (and we were in ski gear) it wasn’t the most welcoming place – eating amongst full ashtrays and duck poo wasn’t the best. They’re obviously keen for you to eat at their restaurant and it was reasonably priced – but this would have easily added $80+ to what has already an expensive day out. I’d thought indoor skiing would be a bit like a sunny September day on the slopes at Mt Ruapahu. It wasn’t – the temperature got as low as minus 5 and I was glad I’d taken husbands advice (that doesn’t happen often) and made everyone wear layers of merino, ski pants, jackets hats and gloves. 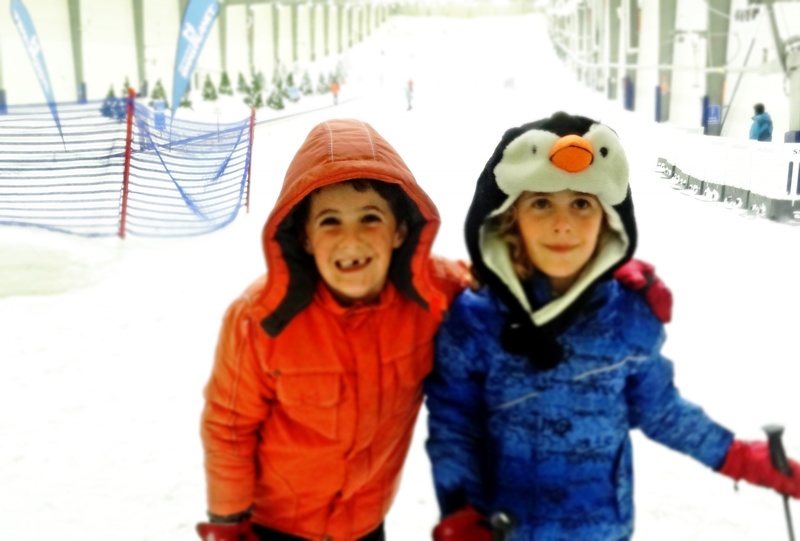 Miss 8 loved her birthday experience at Snowplanet – and so did the rest of the family. If you can wangle it, go mid-week. Not only does it feel more special, but it’s also more affordable. We had the place to ourselves and we skied until we could ski no more without having to wait to get on the lifts. The place did get busy around 4pm when all the after school groups turned up, but by then we had done our dash. Keep an eye out on Grabone or on Snow Planets own Specials Page for great deals on clothing and gear hire as well as the restaurant. Full ski clothing – from thermals right through to jackets, pants, hats and glove – it does get cold in there. Your own snacks and drinks, but maybe budget for lunch in the restaurant if you don’t want to have to take all your ski gear off (including boots if they are rented) and head outside. Your own skis, boots and poles if you have them. Previous PostGiving the gift of: Monster Slide.